The next meeting of the Society takes place on Thursday 14th May 2009 at 7:30 pm in St. Andrew’s Church, Bilston Street, Sedgley. The short Annual General Meeting is followed by an illustrated talk, "Looking at Yesterday". Society member, Eddy Hickey, will be showing slides and photographs he has taken over the last forty years. There are pictures covering Dudley and Wolverhampton to revive memories of a Black Country lost in a generation. Eddy is a keen photographer and member of the Grange Camera Club, Wolverhampton. Dating a building is usually quite a challenge. 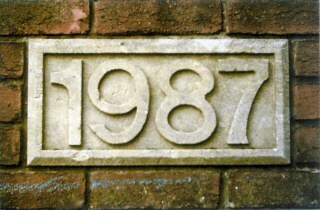 Sometimes precise dates can be found on foundation stones and nameplates. Here the date is given! We asked you to locate the property and try to sort out its brief history. Sedgley’s largest superstore opened in 1987. Although eye-catching, the design was controversial. It was part of the Argyle Group and operated as Presto. Later the High Holborn supermarket passed to Safeway and finally to the Co-Op in August 2004.